It was in April, 1896, the year that William Jennings Bryan captured the Democratic National Convention and was nominated to make his first race for the presidency, that Burnsville's first newspaper began publication. The publication of the first issue of the Black Mountain Eagle began what was to be a 40-year newspaper partnership between brothers-in-law, J.M. Lyon and O.R. Lewis. Lewis, the publisher, was born in Tennessee. At the age of 12 he moved to Texas, and shortly after that, his father, a doctor, decided to return to his boyhood home in Yancey County to practice medicine. Lewis married the former Margaret Ray and they had three sons and two daughters. J.M. Lyon, who edited the Eagle, was born in Tennessee in 1861. In 1884, he married Mary Lewis, eldest sister of O.R. Lewis. They had three sons and three daughters. Lyon inherited the talents of his grandfather and father, who spent many years in the newspaper business. The publication of the Black Mountain Eagle was made possible by the subscriptions of a number of stockholders who felt the need for a county newspaper. They advanced the cash to purchase the material, which consisted of a Washington Hand Press and 200 pounds of type. The stockholders were to receive the paper for one year for each dollar subscribed. Subscribers included J.W. Higgins, G.D. Ray, E.I. Watson, J.E. Evans, I.E. Briggs, S.G. Byrd, M.C. Honeycutt, J.S. Huskins, J.A. Higgins and others. 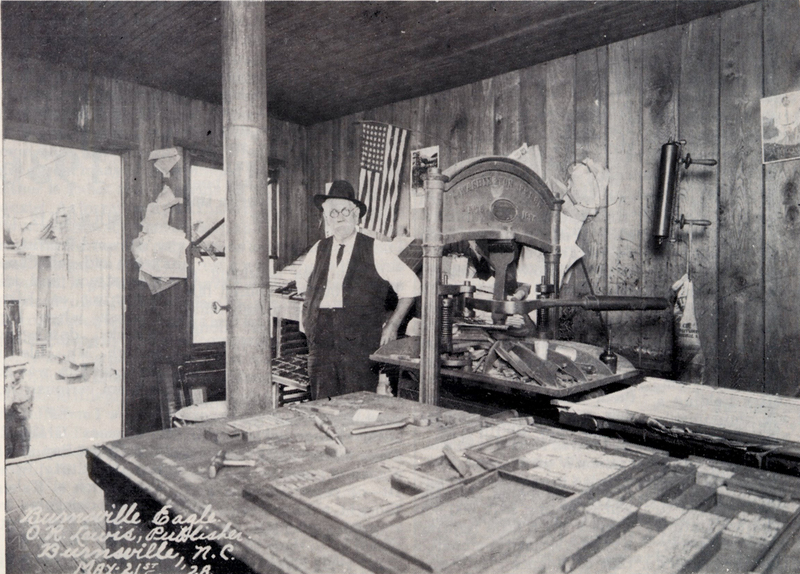 Joseph A. Higgins hauled the press and material from Asheville to Burnsville. It required four days for him to make the trip with wagon and four-horse team. The name of the paper was changed to The Burnsville Eagle at one time, but for 40 years, neither the ownership nor the names of the editor and publisher ever changed. However, around 1914, during Lyon's absence, Charles Ray assisted Lewis in the publication of the paper. Around 1916, the old worn-out press and type were discarded and new material was installed. The presses were operated electrically, but the composition was done by hand. In 1935, Lewis and Lyon retired and sold the weekly Burnsville Eagle to S.T. Henry of Spruce Pine who combined it with the Tri-County News. A group of Burnsville citizens felt that Yancey County should have its own newspaper. So, in 1937 the four established The Yancey Record. They were Mrs. C.R. Hamrick, Dover Fouts, Clyde Bailey and B.R. Penland. Mrs. Hamrick served as editor. These four published the newspaper until 1950 when it was sold to Arney and Trena Fox of Burnsville. Archie Ballew printed the newspaper. Arney and Trena published The Yancey Record until March of 1969 when they sold it to Edward and Carolyn Yuziuk who moved to Burnsville from Florida where Ed worked for the Miami Herald. In April of 1972, they changed the name of the newspaper to The Yancey Journal after a legal conflict with a newspaper chain that had bought a controlling interest. Ed took the matter to court and won back full ownership. In 1985, the Yuziuks sold the newspaper to the J. Ardell Sink family. In the late 1980s, they sold the Yancey Journal to Trib Publications, a Georgia-based newspaper chain. In 1990, Jody Higgins started the Yancey County Common Times, and was joined in the operation by Pat Randolph and Anna Webb, long-time employees of the Yuziuks. In 1995, the Common Times and the Yancey Journal merged, with Higgins, Randolph and Webb sharing ownership and running the paper with Trib Publications. The Yancey County Common Times Journal, or Times Journal as it is known, has been serving the community since 1990. Pictured is Burnsville Eagle publisher O.R. Lewis in 1928. Lewis and partner J.M. Lyon published the Yancey County newspaper, first as the Black Mountain Eagle and later changed the name to the Burnsville Eagle.